Lacey came to Tyree Ag in March 2012. Originally from Satanta, KS, he left southwest Kansas to attend Fort Hays State University where get obtained his Bachelor’s in Crop Science. 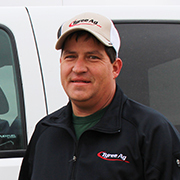 Lacey is also a Certified Crop Advisor and likes working independently and enjoys his one-on-one time with the farmers. Lacey married his wife, Seresa, in 1994 and they have three children; Jessica, Rebecca, and Kelby, and one grandchild. Previously, he had worked for Syracuse Coop, MidState Farmers Coop, and Farmland Industries.